While the US is publishing Core PCE Price Index and Personal Spending reports, NZDUSD is also under the influence of Draghi’s announcement regarding Euro Zone requirement for stimulus. 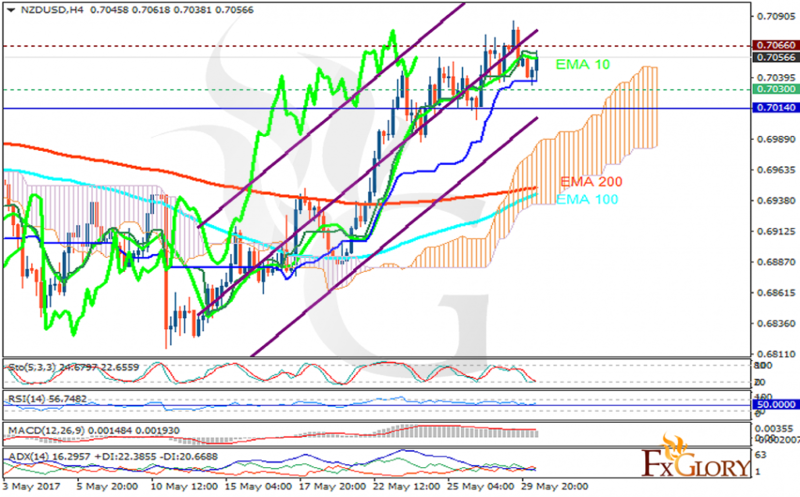 The support rests at 0.70300 with resistance at 0.70660 which both lines are above the weekly pivot point at 0.70140. The EMA of 10 is moving with bullish bias along the ascendant channel and it is above the EMA of 100 and 200. The RSI is moving horizontally on the 50 level, the MACD indicator is in positive territory and the Stochastic is moving in low ranges. The ADX is not showing any clear signals. The price is above the Ichimoku Cloud and the Chinkou Span. The Tenkan-sen and the Kijun-sen are both showing a horizontal trend. The resistance level breakout will be a good sign for buyers to target 0.71 area otherwise, the pair will drop to 0.70.